The Philippine basketball team battles Kazakhstan on Thursday, opening its campaign in basketball competitions of the 18th Asian Games and trying to erase the ignominy of the experience its predecessor suffered four years ago against the same opponent in the same tournament. The Filipinos edged the Kazakhs, 67-65, in what could have been a welcome development and advanced them into the semifinal round of hostilities, but dropped out of contention instead after failing to win by at least 11 points they needed to move up to Group H of the elimination round. The shallow victory sent the Philippines into a 1-win, 2-losses three-way tie with Qatar and its victim. That wasn’t the whole story though. Leading by what turned out the final count, 67-65, with only 11.4 seconds left of the game, the Filipinos tried to extend the match into overtime by making naturalized player Marcus Douthit to intentionally shoot on their own basket from an in-bound pass. The referees, however, the media reported, nullified Douthit’s basket, instead awarding the possession to Kazakhstan, which killed the time until the game was over. 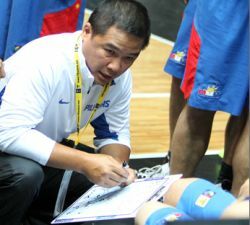 National head coach Chot Reyes later said that before Douthit’s shot, he asked Korean referee Shin Girok during a timeout if shooting at their own basket will be allowed. “The Korean (Korean) referee said yes,” Reyes swore. “But the Iranian referee (later identified as Reza Azarafza), who just kept calling really weird calls on us the whole game, nullified it,” Reyes added. It turned out Reyes and the Korean official were wrong and the Iranian referee was right. “Of course, we want to bring it to overtime to give us a chance to win by 11 points. Below 11, it’s no use to us. We have to do something like that because we want to survive. That’s the format of the tournament,” said Reyes. Reyes’ ill-advised strategy, naturally, drew flaks, not only from foreign media, some of whom accused he Philippine team of virtually trying to throw the game, as well as former national players themselves Ramon Fernandez, Robert Jaworski and Abe King. Fernandez, member of the 1990 Asiad silver medalist squad slammed Reyes’ action in what he termed as a 'disrespectful' and 'shameful' act of instructing the team to shoot in its own basket late in a win over Kazakhstan in the 2014 Asian Games in Incheon, South Korea. "That’s a total disrespect for sports. Winarak niya whatever gains my generation and the previous generations have done for basketball for the country,“ he lamented. "Sinira lang n'ya with one stupid move shooting the basket in our own goal." "You go to war not knowing the terrain and the armament he’ll use, he doesn’t know the rules of the Asian Games, he doesn’t know the eligibility of shooting in your own basket," the former Toyota star and member of the last all-Filipino team to win the Asian title back in 1973 in Manila, denounced. Jaworski, local basketball’s ‘living legend,’ or his part, refused to point fingers at anyone, and instead encouraged the country's basketball leadership to learn from the lessons of the country's worst (seventh place) finish in the quadrennial tournament. “Let’s face it, that’s done. Let’s learn from the mistakes and look forward to the things we would have probably done. Let’s figure out kung ano ‘yung mga pagkukulang. And then, move on,” said Jaworski. “We must realize that winning is something. But the manner by which you win and the quorum that you put together is the best representation the country can make,” added the former Ginebra playing-coach. The now US-based King, likewise, put his former coach at Purefoods (now Magnolia Hotshots) to task at the same time urged the Samahang Baskebol ng Pilipinas to form a selection committee to pick the coaches and players for future national teams.